Inspired by architectural styling, the Fluval EDGE aquarium creates a unique visual effect capturing emotion and serenity within a contemporary setting. 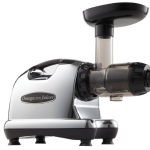 The Fluval EDGE design includes a unique equipment casing which hides and holds all the essentials. Even wiring is beautifully hidden, allowing a good all-around view whether placed on a desk, low coffee table or kitchen top. EDGE brings an exciting new look to aquatics, combining the most modern aquarium design with the beauty of nature. 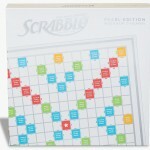 The result is an utterly stylish complement to any home or office space. 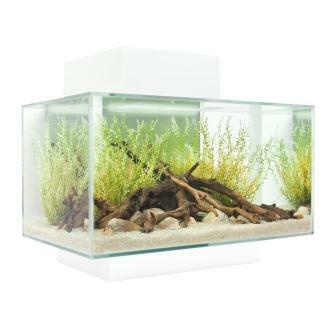 The Fluval EDGE is available in two sizes: a 6 gallon aquarium and a 12 gallon aquarium. Both models have been designed to capture emotion and serenity. 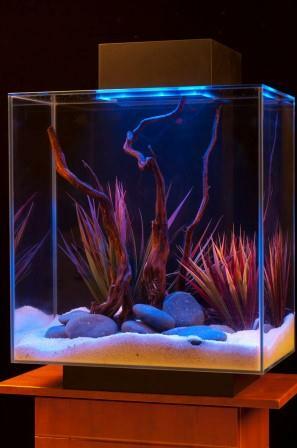 The world’s first 3D water cube aquarium, both models of the Fluval EDGE can be filled to the very brim thanks to the sealed glass top, providing high definition viewing from every angle. The sealed top reduces evaporation for less maintenance and a large, hidden aperture allows oxygen exchange to keep fish healthy. A floating base design gives the set a very small footprint for easy placement and lends the aquarium a clean, contemporary look. 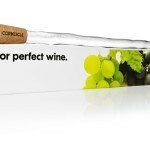 The EDGE is extremely versatile due to its compact proportions. It makes a beautiful addition to any interior where space may be limited and in low light areas, it brings light and life to dull corners and uninteresting walls. Fluval EDGE comes complete with a powerful and efficient 3 stage filter which remains completely hidden, preserving the striking aquarium design. Featuring mechanical, chemical and biological filtration for clear, healthy water, the EDGE filter is much like Hagen’s AquaClear clip on filter range, which has a long history of proven performance. Designed to complement modern decor, the EDGE is available in three stylish colors: black, white and silver. 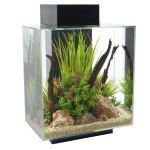 The 6 gallon aquarium is offered in all three colors, and the 12 gallon is offered in black and white. The striking design and contemporary wrap around stand will create a talking point in your home for years to come. Fluval EDGE takes only seconds to assemble and the perforated, removable cover effectively dissipates lamp heat, avoids moisture, and allows easy access to the filter’s lift out media trays. 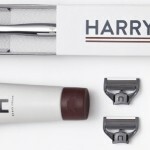 Wide ranges of EDGE cleaning accessories are also available to make cleaning simple. A powerful, retractable LED lighting system creates a visually stunning display. The Edge is equipped with both white and blue LED bulbs, giving you the ability to provide full illumination or a night-time moonlight effect. 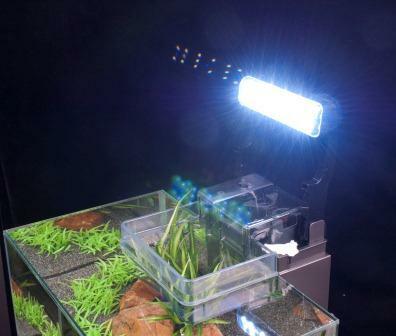 The 6 gallon aquarium comes with a 21-bulb lighting system and the 12 gallon comes with 42 bulbs. Both models have a three position on/off switch for the ability to display Bright Daytime, Deep Blue Nighttime and Off. 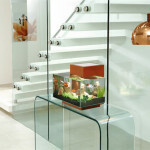 The Fluval EDGE aquarium has been designed for today’s lifestyle with a contoured casing module and a 6-sided glass tank. 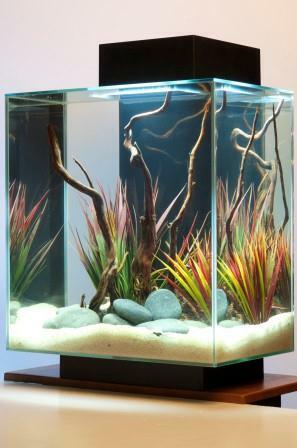 Whether in an ultra-modern or more traditional setting, this versatile aquarium adds the ‘designer’ look to almost any room in the home. The gentle flow of water and glow of the LED lighting produce a beautiful shimmering effect reminiscent to sunlight on open water. 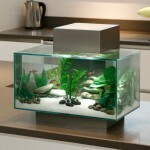 EDGE is quiet, powerful and easy to use aquarium that turns fish-keeping into an extraordinary visual experience. 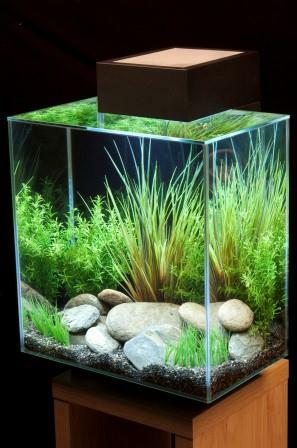 The Fluval EDGE has been designed to be filled to the top. The action of the filter provides all the oxygen exchange fish need. This means that the aquarium can be positioned at a lower level and viewed clearly from above through the glass top, unhindered by equipment or trailing wires.